Mechanical insulation is often an afterthought, something that is rarely revisited once it’s installed. But there are a few critical errors that can be a blow to money and energy savings, and the worst part is that most facilities don’t even realize they’re making them. These mistakes are common, but that doesn’t make them any less serious. Here are the top 3 huge insulation mistakes that waste money and energy for facilities across the country. While it may seem like a no-brainer, uninsulated pipes are one of the biggest energy wasters in many facilities. It may seem as though it’s not a big deal to leave a few pipes or valves uninsulated, especially if they tend to operate at a lower temperature, but the energy loss actually adds up quickly. The National Insulation Association (NIA) conducted a study of over 700 facilities to determine the estimated energy savings, emission reduction and ROI of installing mechanical insulation for the industrial segment. The results of the study are pretty mind-blowing when you consider how much money and energy is currently being wasted. 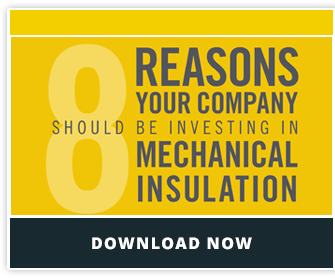 With a typical payback period of a year or less, the benefits of investing in a complete insulation system are obvious. Shockingly, it’s estimated that between 20-30% of all previously installed insulation is now missing or damaged. Failing to repair damaged insulation has a serious negative impact on the entire system, compromising the money and energy saving benefits it was originally designed to provide. Don’t make the mistake of ignoring damaged mechanical insulation. The consequences can result in large energy and money losses. Here are 3 ways you can increase the life of your mechanical insulation system. All mechanical insulation is not created equal. There are types of insulation available for a wide variety of applications, and some are better suited to certain purposes than others. If the wrong kind of insulation is installed in your facility, you could be compromising process control and personnel safety in addition to wasting money and energy. Keep in mind, the “wrong insulation” doesn’t just refer to material. It could also refer to the insulation thickness. If the insulation is not thick enough, it won’t provide the maximum energy saving benefits. The system could have been under-engineered from the start, meaning that an upgrade may be in order.